The Bachelor of Fine Arts in Directing, Playwriting + Production (DPP) is designed to give students the practical, artistic, and intellectual foundation necessary for a successful professional life in live theater and allied disciplines. This program provides practical training for the student who possesses a collaborative perspective. Theater artists must be well-versed in a variety of disciplines, each vital in itself and intimately related to all that occurs in production. 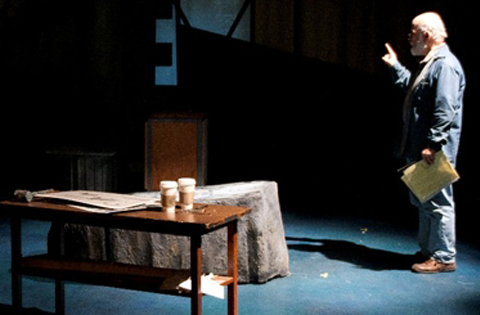 Students majoring in Directing, Playwriting + Production are called upon to develop competencies across a spectrum of these disciplines including directing, stage management, playwriting, dramaturgy and producing, as well as acting and design. At the end of the Sophomore year, each DPP major declares a focus in a particular area of emphasis. This focus is reflected in upper-level courses, production assignments, independent studies, and a year-long culminating Senior project. Internships, arranged through the Brind School’s outstanding relationship with area professional theaters, further strengthen the students’ skills and enhance their professional viability. Students completing the program are prepared to enter the industry in either production or administrative positions and may pursue a range of career options including: directing, assistant directing, literary management, casting, stage management, production management, producing, marketing, playwriting, arts-in-education, dramaturgy, and more. This program is an ideal course of study for the student who has a profound passion for theater and/or the entertainment field, but whose long-term interests are not limited to performing. At its core, the program is intended for interdisciplinary training. The best stage managers understand production from the point of view of the director, actor and producer. The best directors have a profound comprehension of the actor’s process and stage manager’s responsibilities. And the best playwrights understand the acting and directing processes that are ultimately responsible for getting his/her work from the page to the stage. The program is also well-suited to students who may have an interest in advanced or graduate study. be able to initiate theater projects from concept to production opening as a producer, playwright, dramaturg, stage manager or director. be self-starters, promoters, and networkers who will understand how to begin, continue, and promote their lives in the professional theater. have a high standard for theatrical production and work to achieve effective productions as producers, directors, playwrights, and stage managers. They will have a clear understanding of professional practice and will have begun to develop an aesthetic that will grow and drive their professional careers. be effective communicators and collaborators, understanding that the whole of a creative and professional team is greater than the parts that make it up. They will have developed techniques to bring out the best in their collaborators, communicate progress and inspire adjustments to meet professional standards of modern theater practice. understand and insist on preparation for any project with experience in research, analysis, and conceptualization for effective management, direction, and development of dramatic material. be able to apply learned skills to practical theater making. Producers, Directors, and Stage Managers will demonstrate skills of planning, organization, budgeting and scheduling for effectively managing a single production or season. Directors and Playwrights will understand effective storytelling and structure in order to devise, develop, or collaborate on meaningful material for the stage. Directors will be able to make effective choices in staging, working with actors, and collaborating with designers to achieve a level of consistency, vision, and specificity in production. be competitive for graduate programs in theater: stage management, directing, theater studies, dramaturgy, and playwriting; as well as non-theater areas such as business and law. graduate with a professional network (based on working faculty, professional internships, and early career opportunities) that when cultivated and nurtured can continue to provide professional career opportunities.